Depackaging and liquid separation is a key process in volume and weight reduction of waste products. The process separates liquid from containers in order for the component parts to be recycled and reused. Typical applications include: cosmetics, pharmaceuticals, distribution, paper mills, breweries and food & beverage manufacturers. 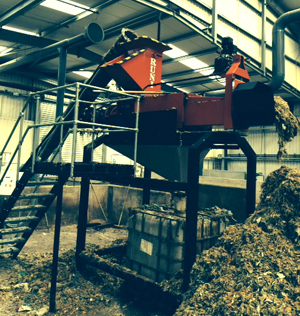 Furthermore, a new application has recently been tried and tested for use in Anaerobic Digestion plants. 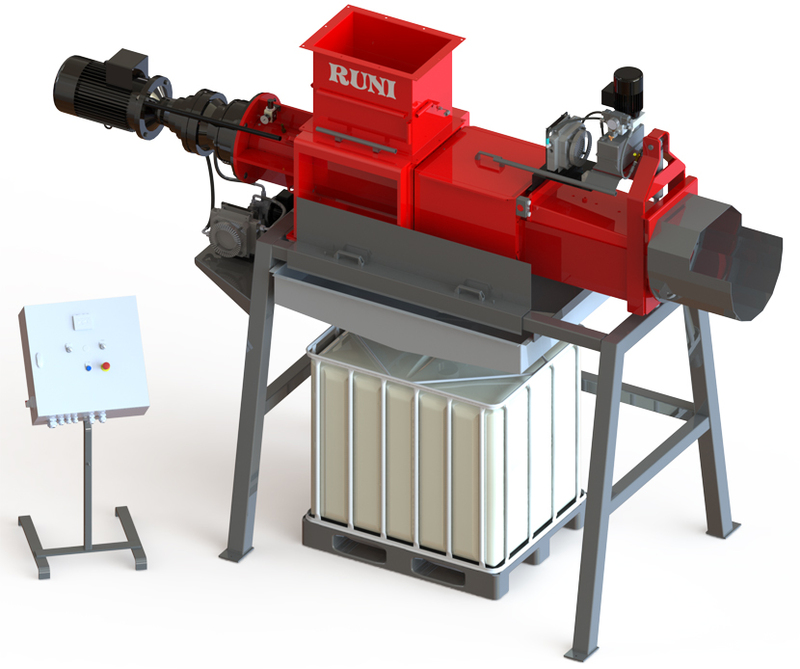 Recent trials have proven the Runi dewatering/depackaging machine to be effective at separating food waste from its packaging. This is a highly effective process that can enhance your AD plant producing an additional, valuable feedstock and reducing the weight and volume of the remaining packaging. Trials have typically demonstrated a reduction in weight by 50%. When processing 2.6 tonnes of food waste in plastic packaging, weight reduction was calculated at 54.7%. This equates to 9 Dolav-type bins of waste being reduced to 2 bins. 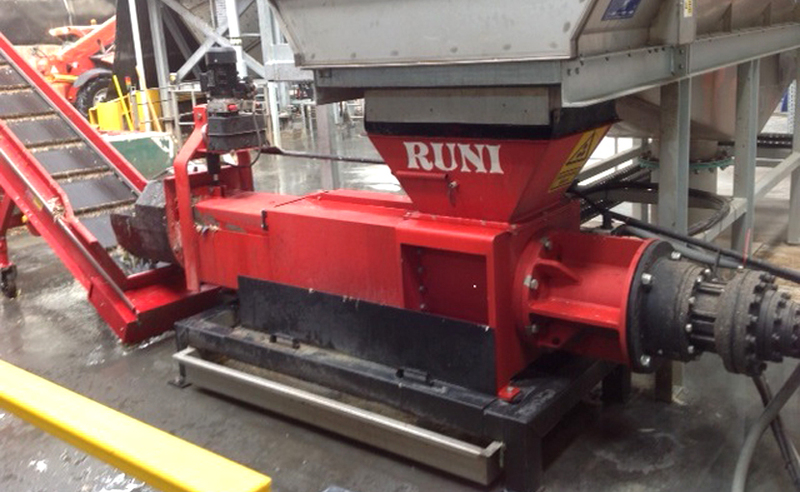 The high pressure in a RUNI Screw Compactor is unsurpassed at separating liquids from dry matter. Due to the screw’s high movement, the process is often more efficient and uses less energy than many traditional methods such as centrifuging or heat drying. The liquid is pressed out through a matrix that is specially adapted to the material and the application. Full or half-empty containers with liquid are compacted and are emptied easily and effectively. Faulty production, test production and returned goods with water, beer, juice, paint, etc. are destroyed immediately and the liquid is collected or led away. The remaining waste takes up less space and is remarkably dry. This often results in lower waste costs and increases the option of selling-on the materials for recycling. For applications where there is not a packaging element, the Vincent Screw Press is more suitable. Dewatering and liquid extraction is used in a diverse range of applications in order to reduce the liquid content of organic material for further processing; typical applications include paper mills, food manufacturers, pharmaceutical research and dewatering of grass and slurry. All of the equipment provided by PRM Waste Systems is CE approved. Do you need more information on this product? Do you want to talk to one of our advisors? Then fill out our enquiry form and we will get an advisor to contact you as soon as possible.